Do you find it is more difficult to hold a pen or open a door than it used to be? Maintaining function and reducing joint pain in your hands and wrists is imperative. Many people suffer from wrist and hand pain, primarily as a result of arthritis or fibromyalgia that limits their ability to do the everyday tasks that used to come as second nature. Your hands perform a variety of tasks every day that require wrist and hand strength – opening jars, typing on a keyboard, holding your phone, gripping a steering wheel, carrying groceries and others. Without the ability to perform these seemingly simple tasks can feel very disabling not to mention frustrating. In many cases, there is a way to maintain functionality using simple exercise in warm water. Since the beginning of time people have used warm water to help alleviate their ailments, decrease inflammation and increase range of motion. 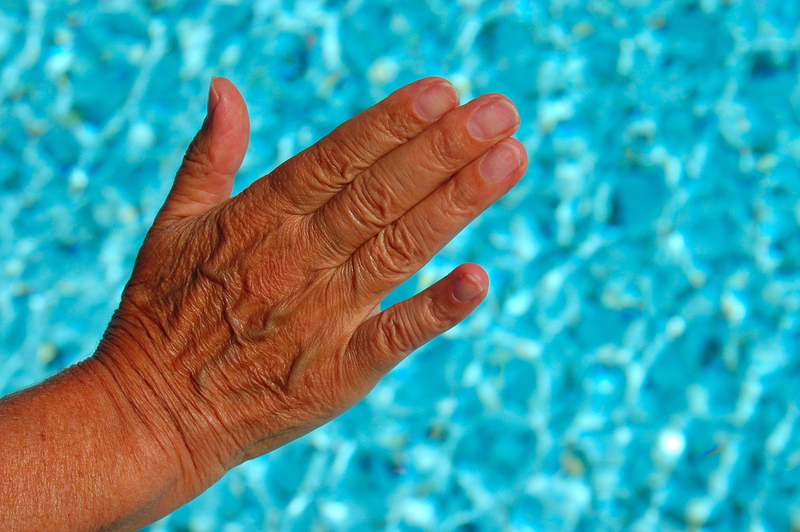 Warm water exercises can help prevent injury, ease slight pain and help strengthen your wrists and keep hands and fingers flexible. Listed below are five exercises you can do on your own in a warm pool or cool hot tub (preferably between 92-100 degrees). Please remember that slow and deliberate movements are much preferred. * Please note: If you have severe inflammation or joint damage, please speak with your healthcare provider before attempting new movements or stretches. With your fingers extended and using your full range of motion, gently roll your wrists each direction 5 times. Squeezing your fingers into a tight fist, holding it three seconds, the stretching your fingers out as far as you can, hold for three second and repeat the process 5 times. Stretching your fingers out, one at a time touch your thumb to each finger, opening your hand between each finger touch. Repeat 5 times. With your fingers stretched our roll them from pinky to thumb and back again in a tapping, or piano-playing motion. With your left hand, gently pull back your right fingers until you feel a stretch on your wrist/forearm. Hold for five seconds, then use your left hand to press down your fingers until you feel the stretch and hold that for 5 seconds. Next switch hands so your right hand is stretching out your left hand.